Part Two of my story of Godspell. Read part one here. Click here to go to the full sermon, where I talk about our experience with Godspell, called “You are the Light of the World.” From 11:30-20:00, I talk more extensively about the salt and the light as found in Matthew 5:13-14. “You are the light of the world,” I sang. And then I went home and reflected on the amazing thing we had just done. Godspell had forever changed me, but in the hours after the show I don’t think I had any idea just how much. It was the last song before intermission. We left the sanctuary rocking. We were half way home, and we all sensed that things were going well. None of our rehearsals suggested that the show would go as smoothly as it had been. At the end of the show, after singing the beautiful refrain “We can build a beautiful city, yes we can. Yes we can. We can build a beautiful city. Not a city of angels, but finally a city of man,” I felt a great sense of accomplishment. After the show a woman approached me. She told me that she had a great time. She loved the music, and she was so glad she could come. For years, she told me, she had a Playbill from the original Broadway production. She also had an album she had never played. For years she had kind of wondered what Godspell was, and when she saw us in the paper, she decided on a whim to come check it out. I told her how happy I was that she was there, and invited her to come again to worship with us. The next day I was talking to our head usher about what a great experience the show was. We were marveling at the amount of people that came, and how many people came that were not a part of our church. I told him about the woman I talked to after the show, and he quickly realized that he knew who I was talking about. I got goosebumps when he told me that, and I thanked Tom for telling me about their exchange. Then I went back into my office and was overwhelmed. Something washed over me that I can only describe as the Holy Spirit as I prayed “Thank you God.” Tears started to flow, and my efforts at standing became feeble. I literally fell to my knees in tears as I was struck at once with an overwhelming sense of awe, wonder, sadness, joy, and purpose. “No one has ever called me that before,” she said. 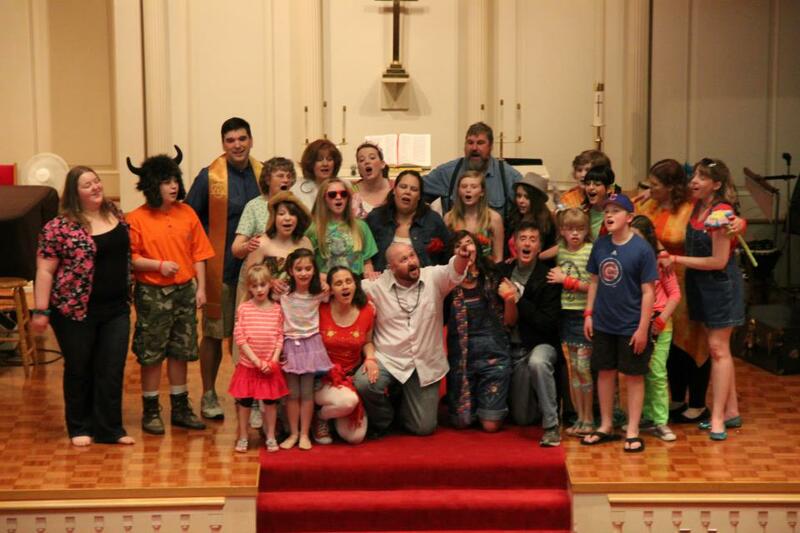 There were so many moments that made Godspell a memorable experience. If it were not for Tom’s story, I would have counted it as a great memory. I would have remembered the impromptu rehearsals in the kitchen with my wife and daughter as we sang and danced together. I would have remembered Molly gently nudging me into the right place so I was ready to be one of the priests in the Good Samaritan parable. I would have remembered the prayer we shared before the show. I would have remembered hugging Dino during the farewell song, and whispering to him. “Thank you, brother.” With or without that conversation with Tom I would have relished in the glow of accomplishing something as a team. After hearing the story of the woman that had never been told that she was the light of the world though, I had something more. “You are the light of the world,” is not just a catchy line in a pretty song in an upbeat musical. “You are the light of the world,” are Jesus’ words to his followers. They are words from what we call The Sermon on the Mount as found in Matthew 5-6. It is a small part of Jesus’ dissertation about what it means to live in this world. “You are the light of the world.” It is a claim on those that had gathered. It is an assurance of what Jesus’ followers are, and what they shall be. “You are the light of the world,” Jesus said so long ago. “You are the light of the world,” Jesus declares today. You. That little musical gave me a lot of things. It gave me memories. It gave me friendships. It gave me knowledge about myself. And it gave me a renewed sense of purpose. It gave me a way to think about my mission as a follower of Christ. I will strive to never allow another man, woman, or child pass me by without letting them know, in no uncertain terms, that they are the light of the world. Has anyone ever told you that you are the light of the world? Hear it now.